Fast rising femcee, Isioma is out with her debut single titled ‘’Holy Ghost Party’’. 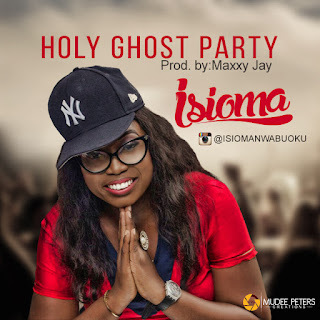 The song "Holyghost Party" is a Gospel song with a contemporary feel, this song will naturally brighten even the dullest countenance and cause you to take to the dance floor. The lyrics of the song bring to mind the fact that Christianity is not boring, and Christians are also entitled to the spice that this life brings. The song reflects a Nigerian beat with a mix of eclectic Western influences, Hip-Hop/Rap and R&B. Watch out for the songs new dawn reassuring us of our decision to serve the Lord in the fullness of his might!!! The artiste born Isioma Joy Nwabuoku on 10th May,is simply known by her stage name "Isioma". A Nigerian from Delta state with a blend of Arab, East Indian from her father's maternal side. She is a Singer, Rapper, Songwriter and performer with natural talent for the stage. From a tender age of six Isioma had been involved in acting and singing in church most of her life. With her parents as her main motivation, She attributes her talent to the tutelage of her father Prof Emeka Nwabuoku a Professor of Ethnomusicology from Columbia University USA . Although she has a BSC in Banking and Finance from University of Benin and an MBA holder from Obafemi Awolowo University her in born passion for the musical arts has been a reoccurring note in her life story. Intro:Mon ami Maxxy Jays beat,Isioma..doing the Holyghost party stylee eh..
Get your game on common cue in this file! Wiggle wind yeh yeh yeh..ee yeh e..